French painter. He and his twin brother, Joseph-Boniface Franque (1774-1833), who was also a painter, were the sons of a modest farmer and, according to a local story, their youthful talent was such that the provincial government paid for them to study in Grenoble. They enrolled at the Ecole Gratuite in Grenoble and stayed for about two years (1786-88), training to become engravers. During the revolutionary period, the twins education was taken over by the Dpartement de la Drôme. In 1792 their case was discussed at the National Assembly in Paris, which placed them in David s atelier and provided a pension for four years. David agreed to educate them but refused payment, writing to the President of the Assembly, I am overjoyed to be chosen to be the first teacher of these youths who could be called children of the nation since they owe everything to her. The two brothers were considered very promising students, and David asked Jean-Pierre to assist him in the execution of the Intervention of the Sabine Women (1796-99; Paris, Louvre). 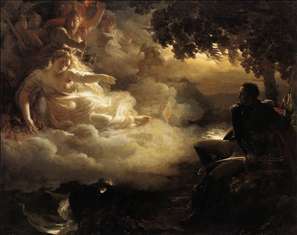 Franque demonstrated his independence from David in the selection of the subject for his 1806 Salon dbut, the Dream of Love Induced by the Power of Harmony (destroyed). In the spring of 1807 he was one of the 26 painters who entered a sketch (untraced) for the competition for a large painting representing Napoleon on the battlefield of Eylau, a competition won by Gros. In 1810 Franque produced Allegory of the Condition of France before the Return from Egypt (Paris, Louvre). This complex picture is a peculiar mixture of the allegorical, symbolic and historical, and depicts a seated Napoleon implored by a personification of France to come to her aid. An inscription within the work reads, France, suffering under an unhappy government, summons from the bosom of Egypt the hero on whom her destiny depends. With its crystalline light effects and imaginative composition, this work is related to the Ossianic subject-matter of Girodet and Grard. Franques work is often reminiscent of the brilliant polished finish of Grards paintings. See more details about "Allegory of the State of France before the Return from Egypt"